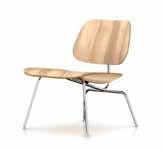 Herman Miller Eames Molded Plywood Dining Chair with Metal Base and Legs - Authorized Retailer and Warranty Service Center - Eames, Molded, Eames Dining Chair, Eames Molded Plywood Chair, Aeron, Mirra, Embody, Celle, Eames Home Office Ergonomic chair. Finish Choices - The chairs are available in four wood finishes�light ash, natural cherry, walnut, and santos palisander. Or you can have them in a richly grained birch veneer stained red or black. Product Story - The molded plywood dining chairs offer the same exceptional comfort and enduring style as the lounge chairs. But they're sized to work at the table. 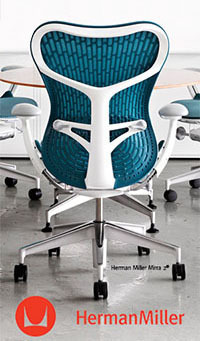 These Eames chairs are molded to fit the contours of the body, so sitting on this icon of modern design feels good. By molding thin sheets of lightweight veneer into gently curved shapes, Charles and Ray Eames managed to give a hard material a soft appearance and establish the foundation for the design of modern furniture. Design Story - It All Started with These Chairs The long and fruitful collaboration between Herman Miller and Charles and Ray Eames began in 1946 with these chairs. The molded plywood chairs were the couple's first attempt at creating a chair that didn't need upholstery to be comfortable and that could be mass produced easily. How Far Could Wood Be Pushed? - Not long after Charles and Ray were married, in 1941, they began experimenting with just how far wood as a material could be pushed. Playing around with a variety of wood-molding techniques, they made a number of discoveries that led to a commission from the U.S. Navy to develop plywood splints, stretchers, and glider shells used in World War II. Charles said that recognizing the need is the primary condition for design. With the war over and the post-war boom beginning, Charles and Ray recognized a need for furniture that was of high quality and affordable, and that could be used in a variety of ways in the rapidly changing average American home. And it occurred to them that the technology they had created for the Navy�molding wood using heat and pressure�could be adapted for furniture. Plywood Furniture? Really? - The American home changed dramatically after the war. The GI Bill allowed returning service members to get college degrees and better jobs, and most of those soldiers wanted a home of their own and a family. Among the many results of this movement were the baby boom and the extensive building of suburban homes, which needed to be furnished. Plywood was not a popular furniture material at the time�it was a building material. But Charles and Ray liked it because they believed it could be mass-produced using dimensionally shaped surfaces instead of cushioned upholstery. They and their team experimented with plywood molding for years before perfecting the final process. 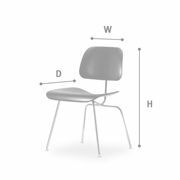 Things Changed - The introduction of the molded plywood chairs, with their lightweight, compound curves, and streamlined visual profile changed furniture design and manufacturing forever. Sculpting a seat and back that fit the contours of the human body, while using relatively inexpensive materials and mass production, the Eames team created a truly comfortable, not to mention revolutionary, chair that's as fresh in today's homes as when the soldiers came marching home from World War II. 33" x 24" x 22"